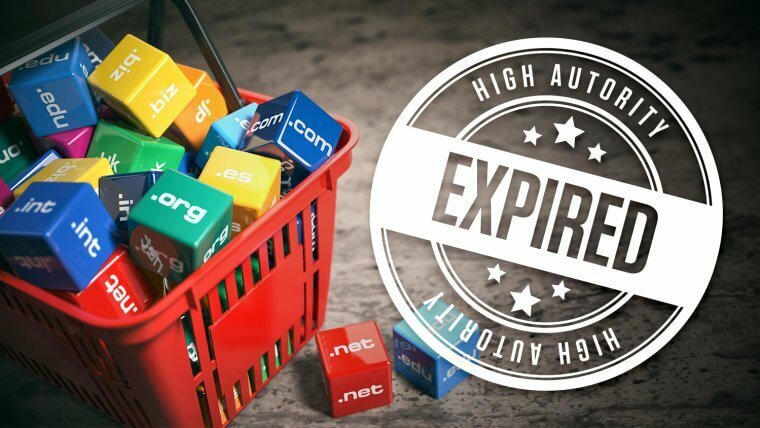 What are expired domains and why would anyone need it? As you might already know, domain names aren’t issued without a deadline . You pay an annual fee to maintain the ownership of any domain and if you fail to make the payment in the specified time, you lose your ownership rights. The domain goes up for sale once again and anyone can purchase it. That’s why in order to get your hands on a recently expired domain name, you can buy it through a domain auction or carry out your own expired domain search. Why Are Expired Domains For Sale and What Can They Be Used For? How to Find High Authority Expired Domains? If your work requires you to have a website, you can benefit from a high authority expired domain. You can harness the power of expired domains as a leverage for your new website. Maybe you are building an e-commerce store or maybe it’s a personal blog – whatever the case may be, you want your website to rank higher. An high authority expired domain can help you achieve that. You can start to rank high in Google’s results right away simply by hosting the website on the best expired domains and adding optimized and relevant content. No need for time-consuming SEO and Social Media Marketing (SMM). One of the ways to check how valuable the website would be for you, is checking which keywords does it actually rank for (if any). Simply go to SEMrush, input the domain into the URL/Keyword bar and hit “Search” – if the expired domain ranks for anything, SEMRush will show. Apart from buying expired domains to build a powerful website, you can also use it to host a blog that contains backlinks to your other website(s). As discussed previously, if the website where backlinks are present has higher authority, it will positively affect the authority of your website. This is called link juice. You add content pieces on your blog and integrate links that take visitors to your other website. The idea is to use the authority of the expired domain to passively enhance the authority of the other site. However, this is a black hat practice according to Google’s guidelines, so you need to ensure that Google can’t figure out that the same person is behind both websites (the original and the blog hosted on the expired domain). Redirection means to automatically take the user to your other website if they click on the link. Your visitors wouldn’t mind being redirected as long as the landing page contains relevant content and information that they are hoping to see. You can use redirection to take visitors to a page or website that has relevant useful content or where you’re selling relevant products. For example, if your high authority expired domain is about second hand books that ranks highly in Google and you also sell second hand books on your website, you can redirect visitors to your own website without fear of penalty. Take the example of Neil Patel’s strategy! He’s redirecting existing authority websites (not expired ones – as far as we know) to his own website. You can also buy expired domains to promote your affiliate offers. Affiliate partners are those who give you a percentage on every sale. This is a clever way of making a quick buck. One of the best tools to scrape out powerful authority domains is Domain Hunter Gatherer (20% lifetime discount). It enables you to find powerful niche domain names quickly and with ease. If you aren’t sure what you are looking for you can simply enter the niche or any related keyword so that Domain Hunter Gatherer can serve you with a complete expired domains list. In the event of any confusions or issues, you can check this step-by-step video for details on how to setup the software for domain scraping. When you use expired domain finder to scrape out high authority expired domains for sale, you may want to recover the old website and its contents. While it may appear a little difficult, it really isn’t. Download the DomRecovery setup and follow the video guide to recover website’s content including images. Other than Domain Hunter Gatherer, you should also use Namecheap. They are constantly creating great deals for you. There is also another opportunity. What if you really like a domain that’s currently in use, but the website behind it doesn’t benefit much from being there, while you, in fact, could. Always remember that not everyone puts domains on auto-renewal, and that sometimes there are auto-renewal payment issues. If any of those is the case with your underutilized domain of interest, you can try to “catch” it in the short window of opportunity between the moment it expires and the moment it auto-renews. Simply set an alert for the domain you like, and who knows, you might be lucky! But why go through the extra effort of finding expired domains when you can easily buy a brand new one at a cheap price? Simply because old domains that have already been purchased and have hosted a website, gain authority which a brand new one can’t offer. To help you get an idea what is “authority”, pay attention to the Domain Authority (DA) metric from Moz. The higher the Domain Authority (DA) – the better. Age of the Domain – The longer a domain name has hosted a website, the higher its value is for search engine’s algorithms. Search engines like Google are more likely to give priority to domains that have been on the internet for quite a while. Content on the Domain – If the website that was hosted on the domain contained high quality content for its particular niche, it heavily impacts the authority of the domain. Again, search engines give preference to domains that host high- quality useful content. There are many other factors impacting the authority of a domain. Because of these factors, the chance of a website hosted on an expired domain to start showing-up in Google rankings right away, could increase or decrease. A brand new domain, for instance, will have to wait for a few days before getting indexed by Google and other search engines, and then its owner will need to go through the tedious process of search engine optimization, which takes time and financial resources. High authority expired domain names on the other hand, offer a short cut and allow you to get down to business straight away. Page authority is another metric crucial to your rankings. Basically, whereas domain authority is the calculated likelihood of a particular domain to rank in SERPs, Page authority is the same metric, but on a smaller, page-level scale. Very roughly speaking , domain authority is a weighted average of the page authority. b) Use the Moz Chrome extension – Moz Rank. It will highlight the authority metric in the toolbar or right on the SERP. Keep a close eye on this one. Who knows why the domain may be expired? What if it got penalized or banned by Google and renewing it just won’t make sense? That’s the information, that Moz Spam Score gives you. This is a metric from Majestic SEO, a well known tool in the industry. That metric analyses how trustworthy a site is by measuring its quality and measuring the quality (“trust”) from a linking site. That’s how the trust “flow” is created. The more relevant trustworthy sites are linking to you, the better rank the domain has. It’s basically the same as Trust Flow, just without the “Trust” part. Plainly, it ranks the domain based on how many sites are linked to it, without considering the quality (“trust”) of those websites. This way the increasing number of backlinks would increase the Citation Flow, but not necessarily increase the Trust Flow. However, websites authority isn’t limited to just backlinks and quality content. The other type of authority that may have an effect on your rankings is Social Media Authority. Well, you probably won’t be surprised that social networks are open to search engine protocols just as any other source of content. Naturally, the content and links there aren’t ranked as high as regular website content, but they still get their share of the SERP pie. Contact established niche leaders on Twitter, Facebook, Instagram etc. And that’s just for your SMM strategy and audience engagement. Social signals are a side effect of the quality of your SMM efforts. Yet again, buying an aged domain, which already receives some social signals, helps you to achieve better rankings. All things equal, should you go in this direction, you could become the owner of a socially established business for a price of around $25, which isn’t a bad bargain. That’s what branded aged domain are all about – you can build a solid brand faster and cheaper, so make sure you take social media metrics into account. With some patience and a little bit of smarts, you can find out many high authority expired domains that you can use for multitude of applications to make money and further your personal goals. Why do all the work from scratch when there’s an expired domain out there featuring all the positives you need?